Welcome! We hope you can join us for one of our events; whether it’s a meeting, workshop or social! ALL WELCOME! We need arty-crafty folks, cooks, chopper-uppers, washing up lovers, music-loving folks, tech-loving folks and more…! We often organise affordable skill-shares and all are welcome! Everyone is very friendly and welcoming too. A blog, on this website, and facebook event or post will usually pop up if the event is definitely going ahead. * End of year shindig! Abundance Social, Wednesday 21st October, 7:30pm – 9:30pm in The Star pub – text 07708776392 to rsvp as we’ll bring snacks to share. bring food to share too! And remember, we rely on volunteers to make things happen. If you’d like to see us do something that we aren’t already, we’d love your help on coordinating and organising events & skill-shares! Abundance Stall @ the One World Fair! 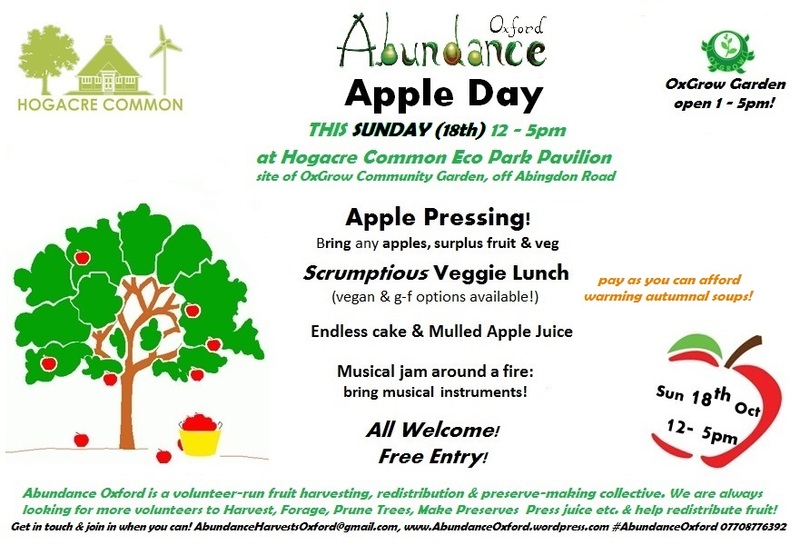 More info here & get in touch to RSVP by phone (07708776392) or email (AbundanceHarvestsOxford@gmail.com). More future events on facebook… (on the calendar and in a handy list too)! 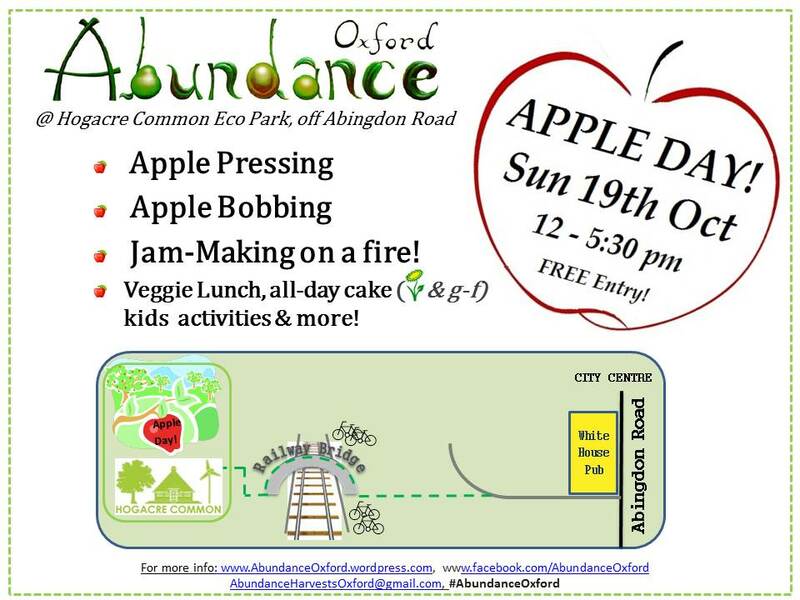 – Sat 27th September: Abundance @ Barracks Lane Harvest Festival: come find us here and join in apple pressing and more! J @ Barracks Lane Community Garden, off Barracks Lane (East Ox) à We’re also hoping to run an apple pressing session with Response Organisation as part of our Outreach work. This is likely to be on one Saturday in September. If you’d like to help out with this, please let us know on AbundanceHarvestsOxford@gmail.com – we’ll make sure that you’re with someone who knows how the press works, and it’s really fun! – 20th – 26th October: Lots more harvests before we lose day-light hours! – Sat 1st November: Disco Soup in Bonn Square: Pumpkin Theme & Pumpkin Festival fun in the evening! Workshops where we learnt how to prune fruit trees & revive neglected orchards into abundant local fruit-bearing resources. If you couldn’t make these but are still interested in learning to prune please register your interest using this form. March 9th – around 60 rootstocks needed grafting. A group of 15 volunteers learnt all about grafting at the Hogacre with Stephen Watts. We organised a foraging walk at the Hogacre Common for The Big Dig. As part of the same event we built an exciting cob oven for Oxgrow. Built a bike trailer for cycling our harvests around Oxford. Stig took us into his house then shared his resources and expertise with us. For more please see blog post. Making jam and jelly at Hogacre Common – we made jam in a big jam pan with blackberries and then cooked up chopped up apples and more blackberries into a jelly over a roaring fire under the stars… wonderful.